They “came from a cage filled with other kittens”? Dude, that’s pretty horrible. Adding: Of course it’s not horrible if the cage was big enough to actually let them run around and play with each other and the other kittens, but I got the impression that this wasn’t the case. They’re super-duper cute though. And I’m happy their lives are better now. Aw, hey, they’re buddies now! Dvärghundspossen, I got them at a (mostly) cageless, no-kill shelter which is at a temporary location while their new building is finished. 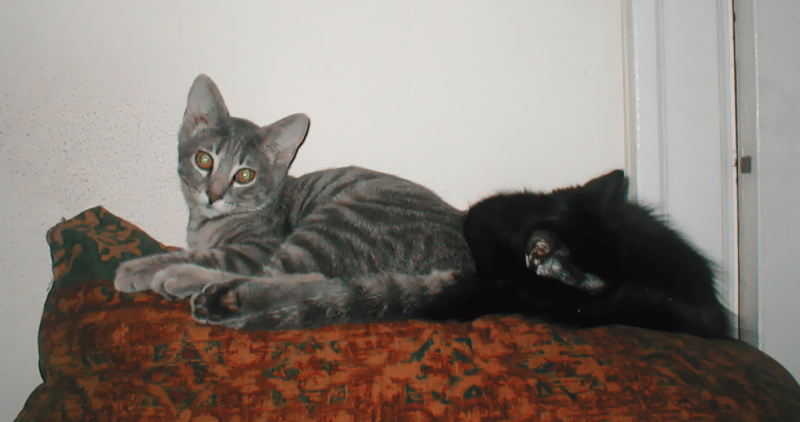 They were part of a larger group of kittens brought there from a kill shelter, and were in the cage to protect them from the larger older cats, and were taken out sometimes to play. Not ideal, but they seemed happy and got lots of attention. The people at the shelter were planning to let them into the general population. At their shelter’s old location (I used to volunteer there), they had separate rooms for kittens, but at the temporary location they only had one big room, with some cages and other enclosures for cats that needed to be separated from the general population. . This is my favourite post today. I’m imagining rooms humans can go in, where they lay on the floor and then the people running the show just unleash kittens into it. I’m imagining rooms ponies can go in, where they lay on the floor and then the ponies running the show just unleash kittens into it. If I weren’t allergic to cats, that would be the greatest thing ever. I guess it would work just as well with puppies though. Oh, the climbing the screens thing annoys me to no end!! 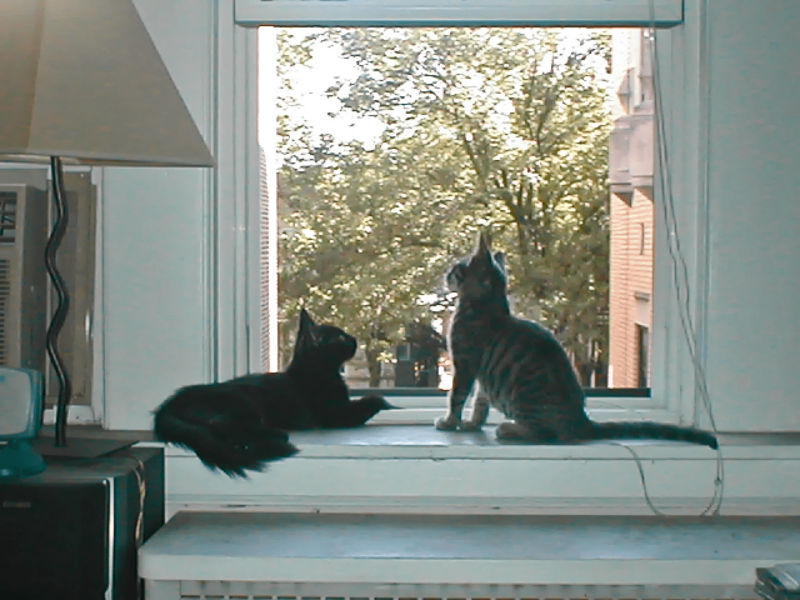 (Because I’m terrified they’re going to knock it out and disappear forever) Mose used to climb the screen, too. I’m not ashamed to admit that I squeed out loud. Such sweet little kitties! Blitzgal, yeah, I’m keeping the window only partly open now so she won’t climb the screen. My last cat destroyed a couple of screens trying to get at squirrels. We just got a new stepper, and i got it set up, and the two torties (Arwen and Luthien) are in major competition over its ownership (rubbing it, going to sleep on one of the steps, and sleeping by it). One of our rescues (pale, long-haired tortie) we named Eloise came from a last chance kitten rescue house which was literally one woman’s house–she had 80 kittens (we ran into her at PetSmart where she had most of them there for adoptions). 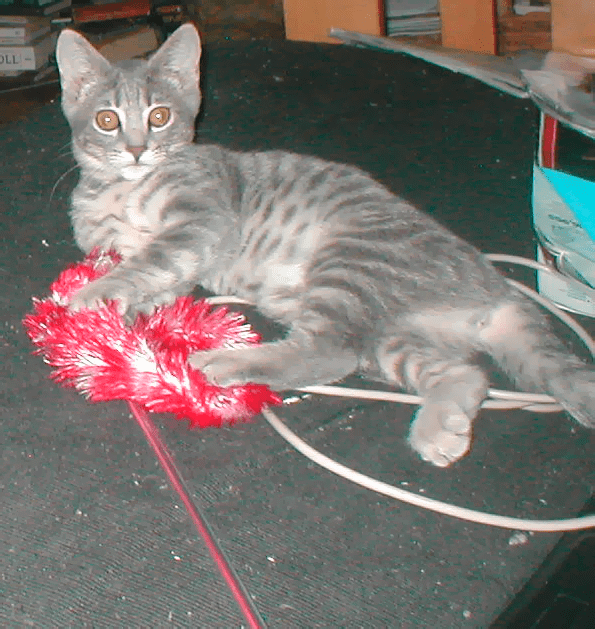 Sourpuss, as she was known then, was rapidly aging out of the ‘kitten’ stage, and the woman was esp. desperate to place her (she was the 11th of what turned out to be our 13 total rescues, and the only one who didn’t bat at eye at the ten others living in the house before her). And they are so freaking FAST at it, too! My windows open side to side and are really tall. I remember once I turned around for like, two seconds, and when I turned back he was almost all the way to the ceiling on the stupid screen. Little doofus. Thanks for the explanation David. It’s great you support a shelter… My sisters have both worked for cat shelters, it’s pretty tough trying to save as many cats as possible. It’s really horrible the way many people treat cats as disposable. I remember the time I did work experience at an animal rescue place. I mostly worked in the cat area (which included bunnies and ponies too), but I did dog walking, cleaning out the animals, all kinds of stuff. Ah the times where my assignment basically consisted of “here’s a bunch of kittens, entertain them for about an hour”. Also, puppies. Squees were had. Okay, I’m just going to hang out here because creepy “my parents & government employees should go to jail for not finding me a girlfriend” dude and “Mu5lims! C1A!” dude are spamming the hell out of the other threads. My last cat destroyed a couple of screens trying to get at squirrels. Our Kami has thrown herself at a glass window trying to get at another cat that was sitting outside. 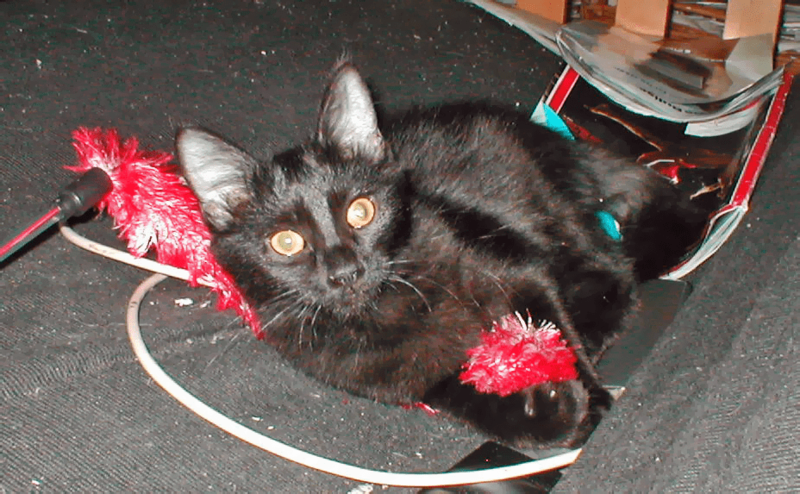 She’s kind of crazy – but she hasn’t drawn blood in something like two months! Progress! I find it funny that your one kitten’s nickname is Pantz because we have a cat named Pants. Looks nothing like your little buddy though. He’s white with brown tabby patches. Oh, little sweeties. I am all squee!!! Hooray for you David, and happy kitten times. Rub those little bellies for us! They look like they doubled in size since the last time you posted photos. What magic is this?! I tried going through Rooshe’s crap but my brain seized up. Would you point me towards the right thread to find this? I think I may know who that is. 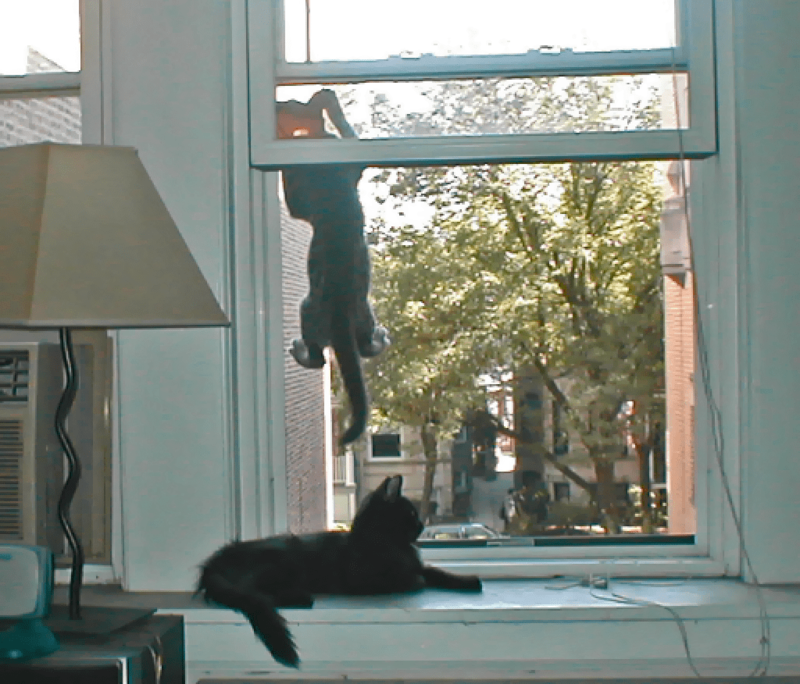 I love how window climbing cat looks like a really determined mime, like he’s climbing air. Of course you know what we really want is video, right? But a bunch of comments have been deleted, due to probable shenanigans. Those pictures are all awesome. 😀 I am so impressed you caught the leaping for bugs picture! I’m actually not a fan of the no-kill movement because I feel all it does is mean that kill shelters have to euth more to make up for the lack of turnover at the no-kill shelters; it also sets up a dichotomy where non-no-kill shelters are called “kill” shelters by default which pisses me off because the people at these shelters do as much as they can to save as many as possible but resources are finite and euthing 4 contagious kittens can be better than infecting 20, no matter how good your cleaning protocols are. Aw, they’ve got a nice lounging area next to a window. hrovitnir, the cat overpopulation problem is tough. 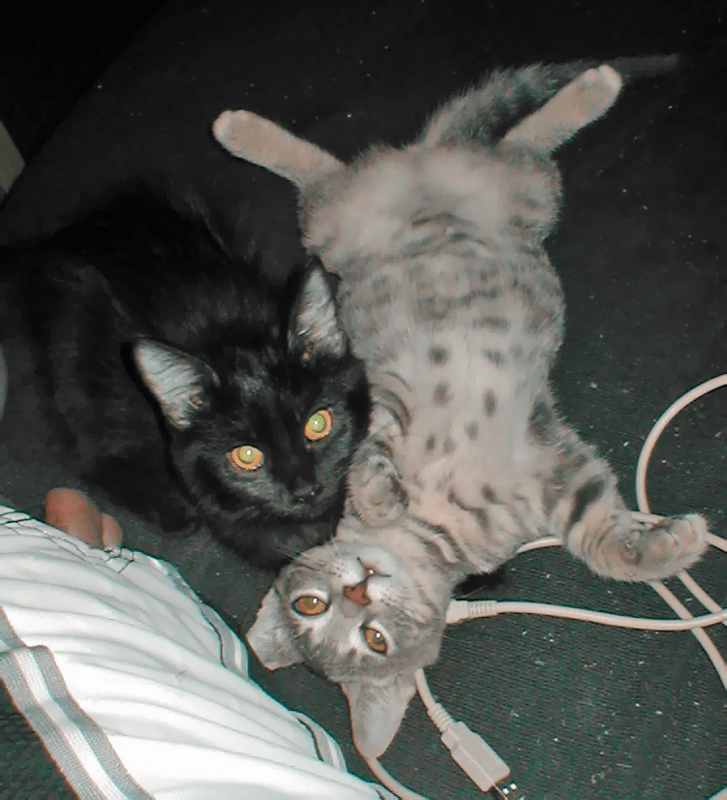 I know that the shelter I got them from tries hard to get as many of their cats adopted as possible. Obviously what needs to happen is for more people to get their cats spayed/neutered (and to get as many feral cats fixed as possible as well). I understand the difficult work the “kill” shelters have to do, but I know that I couldn’t volunteer at one; it would just make me too sad. @hrotvinir, I’m inclined to agree with you as far as no-kill shelters. Were these two already buddies at the shelter? If not they’ve bonded very well! I always thought the “no kill” thing was just “no killing for stupid reasons”, not “no killing whatsoever!!!1111”. I mean, the place I worked at for work experience had a “no kill” rule, but that just meant they didn’t just kill animals that couldn’t get homes. They still euthanised animals for legitimate reasons, like if they were seriously ill and/or suffering, or were dangerous to themselves or others. I don’t know if there’s cultural differences going on here, but I feel like there’s some misrepresentation going on of what “no kill” is about. SQUEEEEEEEEEEEEEE SQUEE SQUEE SQUEE SQUEE all the way home.